I know, I forgot to actually publish this on Friday, and it technically is Sunday, but Featured Sunday just doesn't have the same ring to it and I do like a semblance of order. Thankfully, Blogger offers a neat little back-date feature that I'm taking full advantage of. It's still a bazillion degrees in Dallas and I am so ready for Fall! I have tons of cute stuff bookmarked, so I'm trying to hold out a few more weeks to share it. 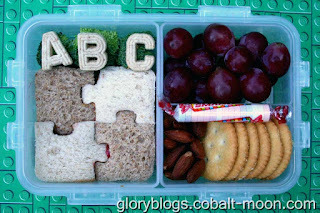 Isn't this an adorable first day of school lunch from Glory's Mischief? I love the puzzle pieces and letters! I'm a wee bit obsessed with the idea of muffins in lieu of sandwiches. Check out the pizza muffins from Lick the Bowl Good--perfect! Jen at Bento for Kidlet always draws the most amazing sandwich toppers. The current Dr. Who ones are no exception (and browse through her others)! Much like my muffin obsession, I think mini-pies have to be better. 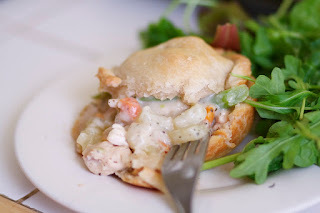 Mini-chicken pot pies from The Baker Chick have much bento potential! LOL! I have a sister in lunch-making out there! I too have been thinking about how every sandwich could be better made as a muffin. And I also love any kind of stuffed bread something or other. Thanks for your ideas! Shannon I love your page. 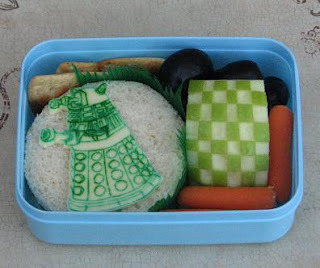 I have spent hours on here finding awesome bento lunch ideas for my kindergartner. Thanks! Thanks so much for posting my Pot-pies Shannon. I love your blog!